June has been very busy but also very wonderful. 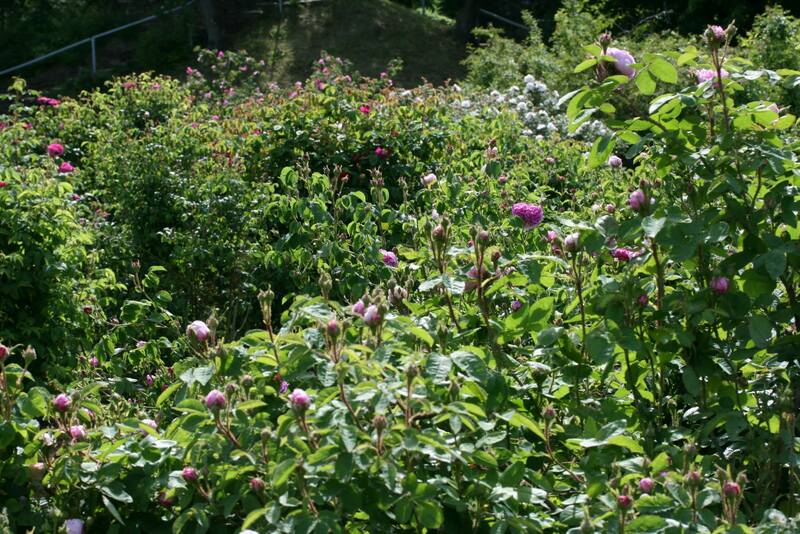 My trip to the Europa rosarium Sangerhausen was like a dream that came through! Walking through the old roses which where in full bloom, was like being in heaven. I have never seen so many of the old roses, let alone see them full of fragrant and beautiful flowers. Even 10 days where not enough to see all the roses and I certainly will visit this rosarium in future many more times. Also the International Heritage Rose Conference, which was held during my stay in Sangerhausen was a great experience and it was wonderful to meet so many old rose lovers from all over the world. Most of the lectures were very interesting, but I really liked the lecture about the history of Sangerhausen. When I have time I will write more about this. I never had imagined that there are still so many moss roses in culture these days; I thought that most had disappeared, but in Sangerhausen there are still some 130 different moss roses planted in the rosarium. Thanks to the conference and new connections a plan has developed, together with Harald Enders from Germany, for a book about these beautiful roses, and we already made a start with the preliminary work. In the shop near the rosarium I had to buy of course some roses and there I found a few rare roses that are only planted in the rosarium; from a dear friend I also received cuttings from some of his roses and on the way back there was just enough place in my car to take them all home. I still haven’t found time to plant these new roses in my garden, so they all wait happily together in my front garden at home, where I can enjoy them all day. The ‘new’ roses are: Valence Dubois, Alba var. vineticola (H. Braun), Rosa nanothamnus, Gallicia officinalis x Étoile de Hollande (by Lens; this rose will be named Étoile Pourpre) and White Bath. From my dear friend Andreas I received cuttings from Centifolia a fleur double violettes, Gloire de France, Carnea plena and Aimable Amie. Also I was able to buy some new books about roses, which of course includes the “Rosenverzeichnis” from Sangerhausen, a beautiful book with pictures from Pinhas: “Die rosensamlung von Wilhelmshöhe” and I was lucky to find a copy of the book from August Jäger “Rosenlexikon”. I’m thinking of making a page on my website with all the books I already have about roses. A small library! Dit bericht werd geplaatst in News en getagged met old roses, Sangerhausen op 20 juli 2013 door Monique.